Packing, moving and leaving it all behind once again when we moved to Jabalpur. It was an obvious change after Delhi: no pollution or traffic chaos. Lots of greenery around and I was actually breathing! The greatest joy was yet to come.. In February 2012, joined Army Asha School, Jabalpur as Principal. 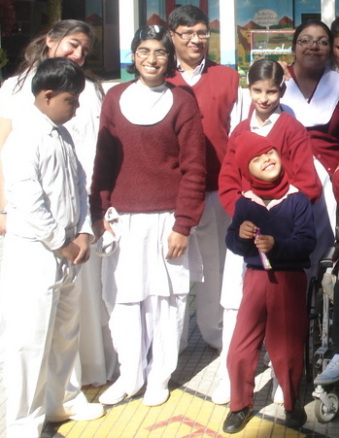 It was the greatest gift of God to give me: an opportunity to work with special children. I was anxious on the first day, doubtful about my abilities to handle them. About the way they would react… would they accept me or not? It was a test I had to pass. The much awaited D-day arrived and I trotted into the school with my heart thumping, adrenaline rushing. The moment I stepped in, I felt the purity of the place. The sanctity touched my heart. I went to each section and met each child, was introduced by the special educators and I found each child responding with love. They are the most innocent beings that I have ever come across in my life. Their genuine appreciation of whatever I did, their thoughtful gestures filled me with wonder. On my very first day, I fell in love with what I was doing! So within a week’s time I was part of their daily routine and their faces lit up on seeing me. It made my belief stronger than ever that happiness cannot be solely from external sources, it comes from within, by doing something that gives you a soulful experience and this was it. One experiences the purest form of love when working with these children. I am always reminded of the philosophy of Socrates: firstly KNOW THYSELF. This may be an old Greek aphorism, but its relevance is eternal. A little bit of introspection will take you a long way on the road of self discovery. Once the process starts, you will start finding the answers to most of your problems, instead of feeling persecuted. On working on ourselves we soon discover what true happiness and what makes us happy. I think that for me, happiness was to be with these angels. The most fulfilling experience was to get them home for a picnic. The thought of an outing and that too to at my house got a smile to every face and gave me immense pleasure. So one day two buses full of kids, teachers and care takers reached home and we all had a whale of a time! Playing, gathering amla fruit, dancing..enjoying the picnic lunch: we all had a whale of a time! It was a day to relish and the memories of which shall remain with me all my life. Gradually while facing the challenges in facing daily, real-life situations, the realization dawned on me: Parents of children with special needs, undoubtedly have bigger challenges to overcome than we ever thought possible! So next on list was the Herculean task of counselling the parents to consider their child as differently abled and not as disabled. Faced with challenges and emotions …it was a new journey to embark upon. When a new born arrives, it brings lots of emotions – happiness,excitement, amazement, joy. But when your baby is born with a physical or mental disabilty, emotions often turn into shock, sadness, anger, bewilderment or anxiety.What do you do with the swell of these emotions? Its easier said than done to deal with the pain, sorrow and rediscovering joy. Your baby is alive and you truly are thankful. Yet, there are things that have died: your dreams, expectations, hopes, wishes. I have lived through the pain with the parents. I would pat myself in helping them accept their child’s handicap and making them believe in themselves and in their child, to focus on what is and not on what is not took the utmost effort…making them see that Is the glass half empty …or half full? The truth is its a bit of the both in this case. Have to recognize and accept the “half-empty” part, purposefully choose to focus on what the child can do: this is the :“half full” part. I have learnt to appreciate them and see the world through their eyes. The special child unaware of the challenges that are lined up by society, lives each day as it comes, enjoying the present moment. He is unhappy when in pain, aggressive when things go wrong and claps his hands with joy on seeing his smallest achievement. They have a spirited soul trapped in a dysfunctional body; that desires to move ahead in life. I wish each child here to be another Malini Chib- a woman who defied all odds to emerge victorious in spite of a crippling disability and indifferent society, who dragged herself out of the limits of her condition. Her autobiography “One Little Finger” is a story of Malini’s search for independence and identity, and her zeal to live a full meaningful life despite lifelong disability. She seemed to have found the strength to salute life and live it with laughter and humour. That’s the message I wish to put across. It is often said by people who mean well that working with children with special needs “requires the patience of a saint”. I disagree. What it does require is human compassion, something most of us have more than we seem ready to acknowledge. Elevating the status of someone who works with a child with special needs to that of a saint is a not-so-subtle a way of saying that the work is so challenging that it requires super-human effort. At the same time, it establishes the justification for not even considering such work. After all, if one is only human, let the saints among us help the physically disabled, lead the blind, comfort the emotionally disturbed and tend the sick. So come forward and be a part of their life! Its so fulfilling, it’s amazing to help these children and build a trusting, working relationship with them. After one year of working here I feel so enriched and have a sense of immense satisfaction. At least I have brought smiles on their faces!